Yeah, big deal, tomorrow's Earth Day. I kind of agree with the sentiment expressed by environmental mag Grist: "Screw Earth Day." By now we should all be doing our part, or at least trying to take small steps daily toward cultivating a healthier planet (and selves). I guess it's easy for me to have this attitude since I'm one of those people who's trying her darndest to lighten her impact on the planet. But there are plenty of people and policies that haven't been infected by the green bug that's been sweeping the nation over the last few years. It's really for them that we still need Earth Day. Been cooped up inside so long you've forgotten how? Listen to the Nature Conservancy's urging to Spring Outside! and learn about ways to find nature near you. Leonardo DiCaprio is auctioning off some of his goods, and his time, on eBay to benefit Global Green USA. Global Green USA is greening America's schools, affordable housing, and cities to combat global warming, lower energy bills, and create green jobs. Global Green is the US affiliate of Mikhail Gorbachev's Green Cross International, and is leading the green rebuilding of New Orleans. Join the Audubon Society of NY for a big environmental lobbying event, Tuesday, May 5th from 9:30am to 4pm. Earth Day Lobby Day is New York's largest annual environmental event, bringing together people from all over New York to hear from government and environment leaders, learn about current legislation, and lobby elected officials on environmental issues that are important to you. We'll be focusing on global warming, e-waste recycling, wetlands protection, and SEQRA standing (aka the "environmental access to justice act"). The all-day event is free and open to all, but you must pre-register by Friday, May 1st. Please put "Audubon New York" in the organization line when filling out the form. We will send out directions and more detailed information to all registrants in advance of the event. Sign up for Earth Day Lobby Day today by clicking here! Not in NYC, not to worry. Check out Earth 911 for electronics recycling in your area. The Park Slope 5th Avenue BID has partnered with the Park Slope Chamber of Commerce to launch a new recycling campaign. Green Grows in Brooklyn, will take place from April 20th-April 22nd — right in time for Earth Day. For more info on this initiative, check out Green Brooklyn. 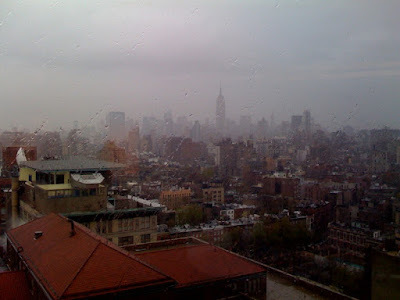 We're having a string of rainy days here in NYC. Of course we need the rain - the street trees need it, the urban gardens need it, the reservoirs upstate need it. But there's a phenomenon that occurs every time it rains here. And I'm not talking about the trashy run-off that pollutes the waterways. 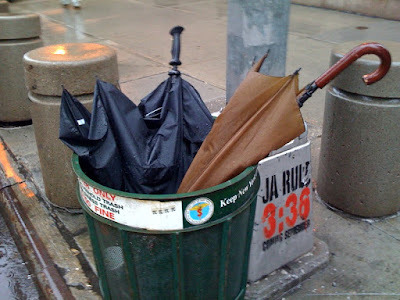 I'm talking about the broken umbrella pandemic. I'd guess that for every rainy day we have, there are hundreds of umbrellas abandoned. They litter the sidewalks and streets, they fill the trash cans, they even end up in the gutter. All I can do is shake my head as I pass all of that wasted metal, nylon, polyester, and even wood. Or can I do something about it? Every time it rains here, an opportunity is overlooked. After the storm, couldn't someone (or a bunch of someones) go around collecting all of this neglected material and do something with it? I know of a shop that once lived in Park Slope (ai ai gasa) that makes clothing out of old umbrella material. Here's a recipe for making an umbrella skirt from RePlayGround (via Treehugger and ReadyMade). How about the metal parts? Maybe someone could make a chandelier with the frame, string some LEDs (like Kenzan Tsutakawa-Chinn) or wire up some bulbs a la Rody Graumans. Any other bright ideas for ol' broken umbrellas?